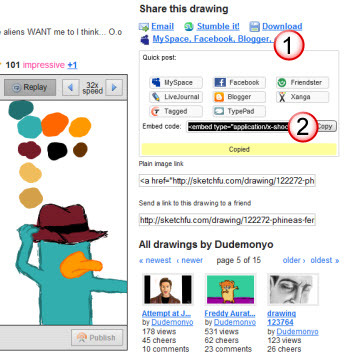 Befunky, Photopeach, and Sketchfu – it’s what students want to do! What are fun (and educational!) activities to do with students that they can also embed into blogs and other websites like wikis? Who better to tell us then the students themselves! So here is a list of tools compiled from recommendations by the Digiridoos, a group of Year 4/5 (9-10 year olds), who each shared what they would include if they were in charge of the Student Blogging Challenge. 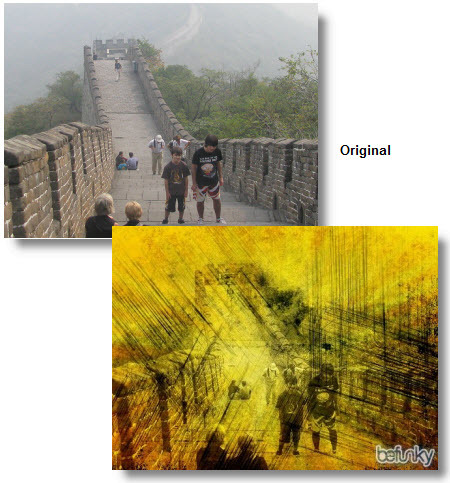 Befunky is quick and simple tool for transforming digital photos into instant art work or digital comics. Extensive range of effects, speech bubbles, accessories, graphics and lot’s of objects that you can add to your pictures. Great for expressing creativity while having fun and providing cool images for spicing up your blog! PhotoPeach is one of the fastest and easiest ways of creating a story or quiz using photos. Presto! You’ve created a story that you can embed as a slideshow into your blog post. 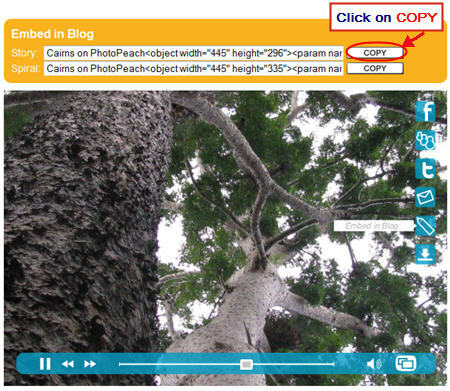 Here’s detailed instructions on how to create and embed a PhotoPeach. Polldaddy is one of the most recognized tools for creating online polls and surveys. Polls provide different opportunities for gauging readers opinions compared to just asking questions in blog posts. Not all readers feel comfortable leaving comments in responses to questions. Polls means readers can express their opinion while maintaining their anonymity. They also provide you and visitors to your blog the chance to gain a sense of how your readers feel on topics since most online poll tools display the results once a visitor has voted. Sketchfu is a simple tool for creating your own cool animations online that can easily be embedded into your blog post. Storybird is a simple to use online digital story telling tool which provides amazing artwork for building your story. Creating your own storyboard is as simple as choosing a theme (layout), selecting the art work you would like to use and then writing your story. With Storybird anyone can create great-looking digital picture book stories. Voki speaking avatars are cool and lots of fun to create. They’re used to add a human element to your blogs. Here’s detailed instructions on how to create and embed a Voki. Wallwisher is an online notice board creator. It’s a really fast and easy way to create engaging activities to use with students. The sticky notes can be as simple as text only OR very creative with images, audio, video, SlideShares, Google Presentations, blog posts (basically almost anything you can link to via their URL)! And students don’t need to have a Wallwishers account to use it! Here’s detailed instructions on how to create and embed a Wall Wisher. 1. Completely write your post including adding title, text, images, tags and categories. 2. 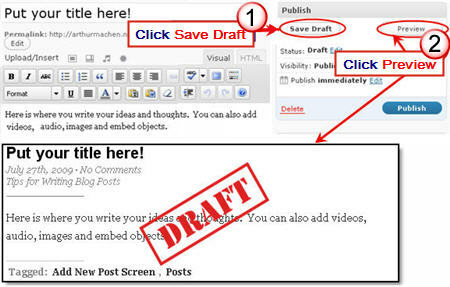 Click on Save Draft, previewed your post and make all necessary edits. 3. Copy the embed code. 4. 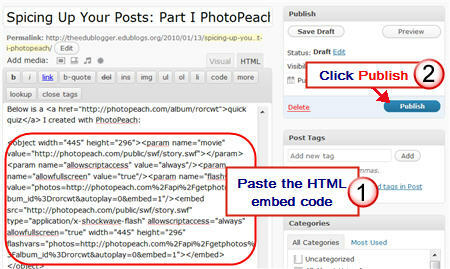 Click on HTML Tab on your blog post. Don’t click back to Visual Tab before hitting Publish as it can break the embed code. Immediately close your post once you’ve published. Change back to Visual Editing mode when you write your next post by clicking on the Visual tab. Thanks to Digiridoos for sharing your favorite online tools! What online tools would you add onto their list? You can also try Glitterboo ( http://glitterboo.com ) for nice sparkle effects and animations. The fun part is that the color and size of the effects are influenced by the picture uploaded so you can get different results each time depending on the photo or graphic that you use. On of the best places to share your stuff and add blogs. nice work on your site i like to come here again? Keep in touch with your friends, add your blogs and enjoy a lot of features! Let’s talk about socializing! Ourclass lets you connect with your friends in other networks, see their updates, interact and communicate … all on Ourclass. Facebook, Twitter, Myspace, LinkedIn, Friendster, Yahoo, Last.fm, Youtube, Flickr. Hi Scooper Nick, if you scroll to the bottom of this post it is added in exactly as per the instructions under Embedding into blog posts. With StoryBird you click on the link that says Embed & Badges once you have created your book. Make sure you add all the code for the Regular size book. i was just wondering how you embedded your story bird in to your post? @BookChook thanks for giving us some more details! @seawolk Vokis are definitely popular with students. Hope you have a nice Christmas break! Some of those online tools look really interesting; I’ll have to try a few of them. I personally love Vokis and I think they add a captivating element to posts. Thank you! I’m still sorry about my friends in Argentina and I loosing touch but I do have their emails so I might try to email them soon. @suewaters I can’t tell you the difference with any degree of accuracy, just go on my instinct which tells me that Glogster takes longer to load. However I’ve never set up an exact model to compare the two. Thanks everyone and looks like I got a bit behind due to the Edublog Awards. @Nathan Thanks for sharing Sumo Paints and kerpoof.com — they both look really cool! @BookChook Thanks for telling us about NotaLand. Assume you have also tried Globster? Can you tell us more about the advantage and disadvantages of each? @james0007 Your BeFunky is really cool! @Stephen Your student posts were really great and I loved how they gave me ideas on stuff I could share with others! Please tell them to keep up the great work. @Marsha Ratzel Hope they enjoy trying them all out! I also love VoiceThreads. Very easy to use and you can be really creative. @Cheryl Glad you like the list compiled from Stephen student’s posts. Please let us know how your students find them! What a fantastic list of new tools! THANKS for putting this together. I can’t wait to share them with my students this week. WOW…our class thinks you’ve offered some fantastic suggestions and things we haven’t discovered yet. We’re going to give them a shot this week. http://voicethread.com/share/1511293/ …it tells about the increasing levels of CO2 and why it’s a threat to our world. A few of my classmates commented and left their ideas. Now I go back and answer their comments. Thanks again for these ideas and we’ll be posting about them on our blog as we try then out!!! Hi, I am Stephen the teacher of the Digiridoos. Thank you for including our ideas about cool tools for using on your blog. The students really enjoyed writing that post and thoroughly enjoyed the Student Blogging Challenge. Now that they are familiar with the tools, I hope to have a few students elect to use them for upcoming assignments.